Centre-forward Darren Henderson signed for Institute on Monday morning. Institute manager Paddy McLaughlin believes new signing Darren Henderson will be his final addition to his squad before Saturday’s Premiership kick-off. 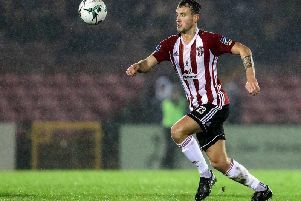 The experienced striker, who netted twice in ’Stute’s 4-2 win over Derry City in their final pre-season game, is likely to be in the squad for this weekend’s league opener against Newry City at the Brandywell. I’m sure anyone who comes here will enjoy the surface and the facility but hopefully they won’t enjoy the result. “After Saturday’s game we had a chat and thankfully on Monday, we got him signed and registered,” explained McLaughlin. “As I said last week, he has played in the Irish League for a long time and has played with some big clubs like Glentoran, Ballymena United and Coleraine. “He has a good track record for scoring goals at big clubs and showed that on Saturday because he looked lively and you could see with his two goals against Derry, he has good instincts as a striker in and around that six yard box. McLaughlin was happy with how pre-season went and, like his players, now can’t wait for the Danske Bank Premiership to get underway this Saturday (KO 3pm). “That’s our pre-season programme now finished against a good footballing Derry City side. It was an excellent work-out for us,” he added. “We got a nice bit of intensity to our play but from Monday morning on our focus has been on Newry. We need to make sure that we keep our work-rate up. If you listen to any manager or player, anywhere and at any level, they would say the main ingredient is hard work. “The Brandywell is a big pitch, so you are going to have to work hard, not just on the ball but especially off it. We’ll be looking to do what we did last year and that’s work hard and try and create as many chances as we can. “We have a lot of pace going forward and a lot of movement in the final third, so hopefully we can score a lot of goals but we also need to make sure that we are strong defensively. “This season is going to be a massive step up for everybody and we all have to sharpen our game up. “You could see on Saturday, we probably started a bit slowly and went 2-0 down but that’s what happens when you play against good players on such a big pitch, they cause you a lot of problems and Derry did that. The ’Stute boss also conceded his players may take a while to get use to their new surroundings. “We had a few training sessions last year and hopefully we’ll train on it this week which will mean we’ll get use to it quicker than other teams,” he confirmed. McLaughlin is keeping his fingers crossed that the ’Stute fan base will expand with the switch to the Lone Moor Road venue. “There’s a great buzz in and around the club for the first match, especially with us playing at the Brandywell. The facilities are first class. The pitch is excellent and the Mark Farren Stand is brilliant, it’s a great venue now for anyone to play football.